Which statement about enabling IM and Presence for a user is true? A. In SMGR, edit the Communication Profile of the user to assign an Avaya E.164 handle and check the Presence profile checkbox. B. In SMGR, edit the Communication Profile of the user to assign an Avaya SIP handle and check the Presence profile checkbox. C. In SMGR, edit the Communication Profile of the user to assign a XMPP handle and check the Presence profile checkbox. D. In SMGR, edit the Communication Profile of the user to assign an Avaya Presence/IM handle and check the Presence profile checkbox. * The SIP Entity field used to route SIP based messages through the Presence Services. Note: Avaya SMGR stands for Avaya System Manager. If more than one Avaya Breeze™ mode is available in the cluster, which statement about redundancy and load balancing is true? 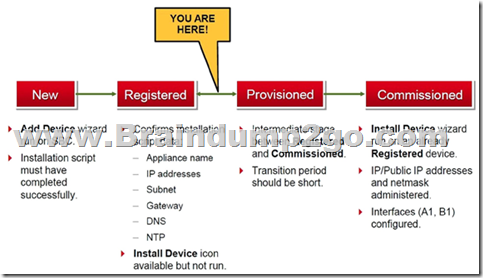 A. IM clients point to any Avaya Breeze™ node SM100 IP address. The client is dynamically informed of alternate Avaya Breeze™ nodes in the cluster. B. The list of all Avaya Breeze™ nodes SM100 IP addresses must be configured in the client. C.The Cluster IP address is not used for Presence Services in 7.0. IM clients configure a FQDN instead of IP address which is resolved by a DNS server to all Avaya Breeze™ nodes in the cluster. D. IM clients point to the Leader Avaya Breeze™ node SM100 IP address which redirects the clients to a particular Avaya Breeze™ node based on load balancing policy. Enable load balancing for a cluster if you want to scale the HTTP services without targeting a particular Avaya Breeze™ server. All the requests are sent to the cluster IP address. When you enable load balancing, two Avaya Breeze™ servers are chosen as the active and standby load balancing servers. The active load balancer distributes the HTTP requests to all the other servers in the cluster in a round robin fashion. When looking at Avaya Aura® System Manager - Home > Services > Replication, what is the name of the replica group representing the EDP / Avaya Breeze™ instances? 1. On the System Manager web console, navigate to Services > Replication. 2. In Replica Group column, click CollaborationEnvironment_3.1. 3. In Replica Node Host Name column, locate your newly-deployed Avaya Breeze. What should be verified before running the initTM –f command on the Command Line Interface of Avaya Breeze™ platform (formerly known as Engagement Development Platform (EDP))? A. Verify that Avaya Breeze™ is configured as a Managed Element in Avaya Aura® System Manager. B. Verify that an enrollment password is configured on System Manager and that it has not expired. C. Verify that a valid Certificate is installed on the Avaya Breeze™ instance. D. Verify that Avaya Breeze™ is licensed. See step 8 and step 9 below. 3. In Replica Node Host Name column, locate Avaya Breeze™. 4. Verify that the status of the Synchronization Status field is green. If not, go to Step 5. 5. If Presence Services Snap-in has been deployed, in the Product column, verify that both Avaya Breeze™ and Presence Services are displayed. 6. Select Avaya Breeze™, and click Repair. 7. After 2–15 minutes, verify that the status of the Synchronization Status field is green. If not, go to Step 8. 8. Verify that Enrollment Password is not expired. a. Navigate to Services > Security. b. In the navigation pane, click Certificates > Enrollment Password. a. Enter a password, and click Commit. It is highly recommended that the same password must be used. Otherwise, Avaya Breeze™ and Presence Services must be re-administered, because System Manager Enrollment Password was configured during deployment of Avaya Breeze™. b. Open an SSH session to the Avaya Breeze™ Management Module IP address as sroot. c. On the command line interface, enter initTM -f.
d. When prompted for the enrollment password, enter the password that you provided in Step 9a. e. Repeat Step 1 to Step 6. Before SIP Trunking configuration can begin, which state must the Avaya Session Border Controller for Enterprise (SBCE) be in? System Management > Installed tab shows SBC(s) Commissioned indicates a successful initial console configuration. After the initial provisioning script has been run you see your Avaya Session Border Controller for Enterprise (SBCE) displaying a Registered state in the Web GUI. You click on the install link in the EMS System Management > Devices menu to continue the installation. From a remote worker's SIP Endpoint connected via Mobile Workspace, which tool is used to trace the successful way through Avaya Session Border Controller for Enterprise (SBCE) of an Invite message? traceSM is an interactive perl script that allows an administrator to capture, view, and save call processing activity on a Session Manager. While not as powerful or versatile as wireshark, traceSM is absolutely essential when it comes to working with Avaya SIP. First off, it allows you to view SIP messages even if they have been encrypted with TLS. D: traceSBC is a Perl script that is run from a PuTTY or TuTTY session connected to the SBC's Management (M1) IP address. It is used to monitor sessions. The provisioning script automatically runs as part of the first boot-up of the Avaya Session Border Controller for Enterprise (SBCE). During this process you assign the Management IP address to the SBCE. On the System Management > Devices web page, which status does the SBCE display before the Install link is clicked? The tcpdump tool is the main troubleshooting tool of Avaya SBCE, which can capture network traffic. Using tcpdump is a reliable way to analyze the information arriving to and sent from the SBC. However, tcpdump has its own limitations, which can make troubleshooting difficult and time consuming. This traditional tool is not useful in handling encrypted traffic and real-time troubleshooting. In Real-time mode, traceSBC must be on active Avaya SBCE. traceSBC is started without specifying a file in the command line parameters. The tool automatically starts processing the log files. The live capture can be started and stopped anytime without affecting service. 1. Log on to the EMS web interface with administrator credentials. 2. Select the Logs option from the toolbar, and click the System Logs menu. The system displays the Syslog Viewer screen. On this screen, you can specify criteria in the Query Options section to filter the results displayed. 3. In the Start Date and End Date fields, filter the results displayed in a search report to fall within starting and ending dates and times. In previous Avaya SBCE Syslog Viewer windows, there were four separate fields: Start Date, Start Time, End Date, and End Time. In the Avaya Session Border Controller for Enterprise (SBCE), before a traffic carrying Network Interface (A1 or B1) can be pinged, to which state do you have to toggle the status on Device Specific Settings > Network Management / Interfaces? 3. Click the Toggle link for both the A1 and the B1 interfaces.